"More than 60,000 migrants have died on the move since the year 2000," U.N. Secretary-General Antonio Guterres said. 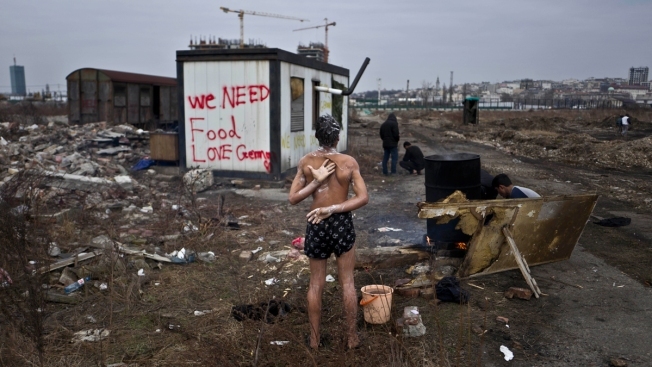 "This is a source of collective shame"
In this Saturday, Feb. 11, 2017 file photo, a 14-year old unaccompanied minor, a migrant from Afghanistan, showers on a cold day near an old train carriage where he and other migrants took refuge in Belgrade, Serbia. Defying fierce opposition from the United States and a few other nations, nearly 85 percent of the countries at the U.N. agreed Monday on a sweeping yet non-binding accord to ensure safe, orderly and humane migration. "More than 60,000 migrants have died on the move since the year 2000," he said. "This is a source of collective shame." Opponents often fear that an influx of migrants can dilute their countries' character, import poverty or crime, reduce wages and take jobs from tax-paying citizens.